Anyway, I just like that it’s there. Though why a cow exactly? Any particular reason for that, do we know? What I DO know is that it was created in 1987 by Tom Gleeson – the same hand that welded the gorilla that now lives in Queen’s Park. 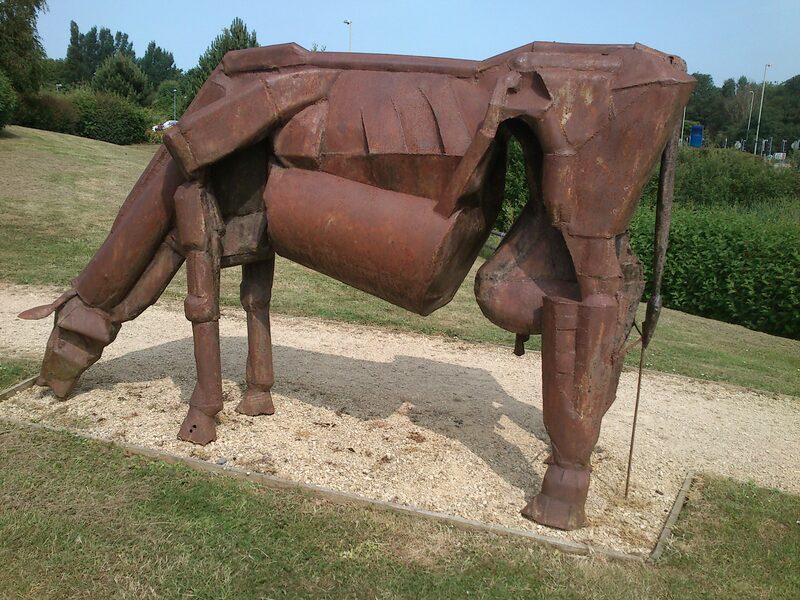 19/07/2013: UPDATE: well, while we might not know why exactly it’s a cow rather than any other animal we do now know, thanks to a comment on the blog, this: It used to be at PMH, in an internal courtyard/garden as I remember, and was moved from there when GWH opened. Don’t remember exactly how long it had been there, only that it appeared some time between 1983 and 1990 (dates I worked at PMH). It used to be at PMH, in an internal courtyard/garden as I remember, and was moved from there when GWH opened. Don’t remember exactly how long it had been there, only that it appeared some time between 1983 and 1990 (dates I worked at PMH). Just found this in the Central Library’s Flickr collection. Hope it will link. Thanks! That’s great. I’ve linked to it on https://www.facebook.com/BornAgainSwindonian – I’ll add it to the blog post another time. Thank you so much. 🙂 This is exactly what I wanted. Cheers!